PRINCE ALBERT, SASK. 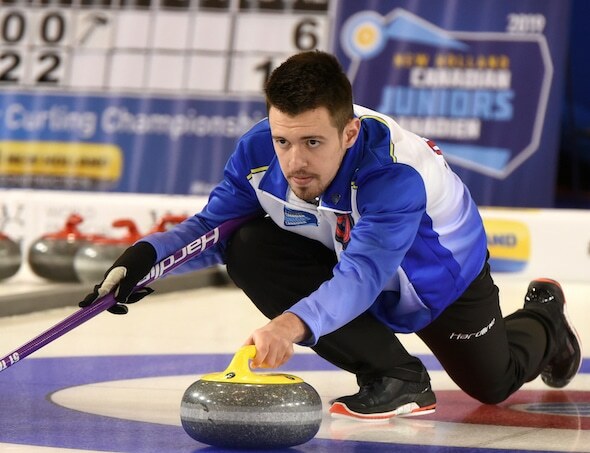 — With a 7-3 win over Nova Scotia’s Graeme Weagle in the final game of the Championship round at the New Holland Canadian Junior Curling Championships in Prince Albert, Sask., B.C.’s Tyler Tardi moved directly to the gold-medal game and has a chance – with vice-skip Sterling Middleton – to earn an historic third straight national Junior title. That experience is going to come in handy, said Tardi, as the pressure and media coverage ramps up during the playoffs. Tardi said the addition of Matt Hall has be a huge positive in the team’s success this season so far. As for prepping for the final, Tardi said the team won’t be sitting around relaxing. The men’s semifinal match-up is also clear after Manitoba’s J.T. Ryan battled to a 9-4 win over Saskatchewan’s Ryan Kleiter in a game that was much closer than the scoreboard shows. The first four ends were all Saskatchewan, but Manitoba turned it around with a deuce in the fifth and a couple of steals to take a 5-4 lead after seven. In the ninth, Kleiter attempted a tricky cross-the-rings double and just missed, giving up a single and trailing by two with hammer in the final end. Facing an almost-impossible angle-raise takeout with his final shot, Kleiter flashed, giving Manitoba the 9-4 win. Kleiter will have a chance for revenge, however, when the teams meet again in Saturday’s semifinal at 7 p.m. (all times Central). 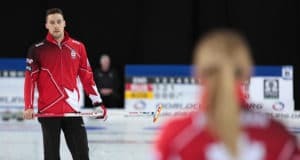 In other games on the men’s side, Alberta’s Desmond Young scored four in the ninth to surge ahead of Quebec’s Vincent Roberge for a 9-5 win, and Ontario’s Sam Steep finished off the Seeding Pool round robin with a 9-3 win over Sawer Kaeser of Northwest Territories. Northern Ontario’s Tanner Horgan defeated Newfoundland and Labrador’s Greg Blyde 9-5, but will miss the playoffs. On the women’s side, Alberta’s Selena Sturmay, who completed the competition with a perfect 10-0 record, is through to the gold-medal game, but a tiebreaker will be required to determine the last playoff spot, thanks to a win by Nova Scotia’s Kaitlyn Jones, the defending Canadian and world junior women’s champ, over Quebec’s Laurie St-Georges (a rematch of last year’s gold-medal game at Shawinigan Que. ), leaving a logjam of teams at 7-3. Based on team last-shot-draw performance, Nova Scotia moves directly to the semifinal, and a tiebreaker between Quebec and B.C.’s Sarah Daniels will determine the other women’s semifinalist. Daniels lost her final game to New Brunswick’s Justine Comeau, 9-4. In the only other game, Manitoba’s Mackenzie Zacharias stole her way to an 11-3 win over Northern Ontario’s Kira Brunton. Both teams will finish out of the playoffs. The tiebreaker will take place on Friday afternoon at 2 p.m. (Central). 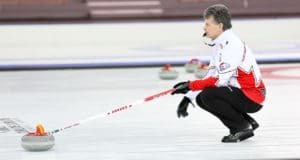 The game will be streamed live exclusively on Curling Canada’s Facebook page. 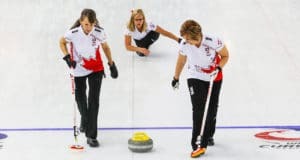 TSN/RDS2, the official broadcaster of Curling Canada’s Season of Champions, will provide live and exclusive coverage of the womenʼs and menʼs semifinals on Saturday, Jan. 26, and finals on Sunday, Jan. 27. The same games also will be streamed live in the U.S. on ESPN3. CLICK HERE for streaming and broadcast information.